Can Tiger Woods reinvent his golf game as he turns 40? Can Tiger Woods reinvent his golf game? The ominous reports about his demise notwithstanding, Tiger Woods is going to play golf again. At what level and how well and for how long are all questions that have no answer as he turns 40 -- his age alone leading to as many doubts as the three back procedures -- making his return a mystery. But Woods never said he was done, pledging to come back at some point, presumably after he takes plenty of time to recover from his latest surgery in October, the third in 18 months. Woods was unable to offer a timetable on when he could even begin rehabilitation, let alone swing a golf club, leading to understandable doubts for the 14-time major champion. Getting healthy is clearly priority No. 1 and short of that, nothing else really matters. If Woods were to regain his form and fitness -- huge "ifs'' at this point -- what kind of golfer would he be? Or maybe, what kind of golfer should he be? Woods' ability to overpower a golf course as he did early in his career is no longer as pronounced, certainly not now with back issues seemingly limiting his ability to swing with such force -- even though he was hitting 300-yard-plus drives in his last tournament at the Wyndham Championship in August. But there has long been conjecture in golf that Woods can dial it back, not seek the distance off the tee that he still possessed in an injury-plagued season. He could better manage his game and maybe, just maybe, lessen the physical toll. 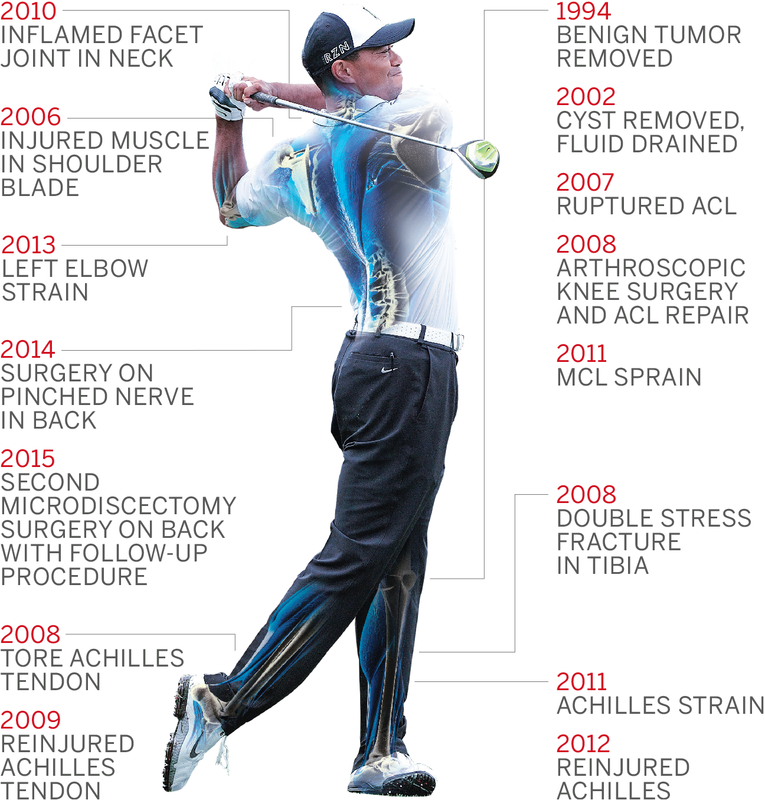 -- Tale of the tape of Tiger Woods' injuries. "If I don't hit it as far, hopefully hit more fairways,'' Woods said. "Understand how to play more iron shots into the correct spots. I've learned a few more shots around the greens in the past couple years. Implement those in my short game. [With my] putting ... some of the things I was working on at the end of the year were starting to click. In essence, Woods is talking about reinventing himself. Whether he really believes that, or will seek to follow that path, is purely conjecture. There would seemingly be many steps to take in his recovery before implementing any kind of game plan. But there is certainly a sense that he can do so if he chooses -- and find success. "He has to reinvent himself to an extent,'' said Hank Haney, one of Woods' former instructors. "And he's done that to a degree. He played [some of] his best golf [in 2015] at Greenbrier (T34) and Greensboro (T10). These are two short golf courses. Greensboro was a course where he had to hit very few drivers and there weren't as many chances to hit it on a hazard or out of bounds. That's a reinvention. In the past, you wouldn't have said that was a perfect course for Tiger. Woods didn't play enough rounds in 2015 to be ranked, but his 46.77 percent scrambling percentage -- getting up and down for par from various places off the green -- was worse than No. 184 Charlie Beljan, who was at 48.77. While Woods made huge improvement in his short game from the chipping woes that plagued him at two early tournaments, the bottom line is he still was lousy at a part of the game where previously he had excelled. As 2015 was Woods' worst year as a pro, it is no surprise that most of his other statistics were also poor, including a scoring average per round of 71.933, which was nearly three full strokes worse than world No. 1 Jordan Spieth. Woods' driving distance of 300 yards was more than respectable and would have ranked 25th, but he hit only 65.10 percent of his greens in regulation, which would have ranked 127th. And his strokes-gained putting of .328, while a respectable 66th, couldn't overcome a -.908 strokes-gained tee to green, which would have ranked 176th. "The thing he has going for him is his experience,'' Haney said. "Experience counts for a lot. His management skills. I still believe if he puts himself into position, he knows what to do. I don't buy into the notion that he can't finish or hasn't been there for a long time. You don't forget things. When Woods was at his best, he created enormous torque in his swing. He had clubhead speeds not before seen in golf, which helped him hit it far with everything in his bag -- even as a skinny, 160-pound 21-year old. Over time, there were the knee injuries, including a total reconstruction in 2008. And then the back problems, which first surfaced in 2013 -- a year he won five times and ranked third in strokes-gained tee to green. Most believe even a diminished Woods has the strength and skill to hit the ball plenty far enough. Perhaps not in the range of Rory McIlroy and Jason Day -- two of the game's longest drivers -- but certainly with Spieth, who averaged 291.8 yards off the tee in 2015 to rank 78th. It was Woods himself who said, upon his return in June 2014 after his first back surgery, that he could no longer rely on length as he had previously. "But just like [Michael Jordan], I've got a fadeaway now,'' Woods said then. "I've had to rely on different parts of my game and strategy and understand how course-management skills are improved -- where to miss it, how to miss it, and obviously the amount of shots that I've learned over the years." Woods could even point to Graham DeLaet, who had a microdiscectomy in 2011 (the back procedure Woods had twice.) The Canadian was 32nd in driving distance in 2015, averaging more than 298 yards off the tee. "In his day, [Tiger] was the best 5-iron player on tour, the best 7-iron player, he wasn't just the longest,'' said two-time U.S. Open champion Curtis Strange, an ESPN analyst. "He was the best long-iron player. The ability to hit the ball is the ability to hit the ball. "As you get older, the game is in constant evolution. You have to adjust. Those who do, do well. [I] love Davis' [Love III] swing. Freddie [Couples]. They have evolved well as they aged. If Tiger can get to his own swing, whatever it is, yes, he can do it. But if the swing is mechanical, if he has to think about it every single time, it doesn't last. When Woods won his 14th major at the 2008 U.S. Open, it seemed all but inevitable that he would match or surpass Jack Nicklaus' total of 18. He was well ahead of the Golden Bear's pace, only falling behind it in 2014 when he failed to notch a 15th at 38 -- the age Nicklaus did so in 1978. Woods will begin 2016 four majors behind Nicklaus. Sure, Jack won three majors in his 40s. So did Ben Hogan, who overcame a serious car accident a few years prior. Haney, who coached Woods during a run of 31 PGA Tour titles and six major wins from 2004 through 2010, believes there are more victories ahead for Woods. "If he's forced to reinvent himself, he will,'' Haney said. "He's forced to take a slower [swing] path back, and he was doing that. I think he clearly doesn't want to have any more surgeries, any more pain. For now, Woods is having trouble doing just that. His rehab recently consisted of only walking. So who knows when any of this can commence, if he is anywhere near getting with his current swing coach, Chris Como, to map out a plan. "It is a real test of my patience and resolve; it's been tough,'' Woods said. "I'd like to first be able to get my health good enough so I can participate in things I enjoy the most, which is my kids and playing sports with them.